Why would you want a MAC or a New Big MAC? If the acoustic environment inside your workplace is too noisy for the measurement that you need to make then a MAC or a Big MAC can provide a noise refuge in which the test item can be placed. The level of attenuation that can be achieved is > 80 dB at high frequencies. A MAC can deliver the results you need for < 3% of the cost of a hemi-anechoic room. Alternatively if the testing you have to do generates very high sound pressure levels then by placing the test inside a MAC you will stop annoying your neighbours. MACs can be manufactured to meet a wide variety of applications and can be made to fit the space that you have available. The dimensions of a MAC will influence what you can reliably measure. A MAC designed for use at high frequencies f > 500 Hz will be light enough to reposition easily within your laboratory. To achieve good absorption/attenuation and provide a valid measurement at frequencies below 500 Hz will normally mean a Big MAC with all dimensions exceeding 1 metre and weighing more than 300 kg. Consequently the Big MAC requires careful handling when delivered to site and is not so easily moved as a MAC. 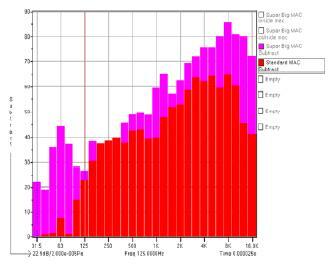 The 1/3rd Octave levels record the difference in sound pressure level measured inside and outside the MAC. The external microphone was positioned 0.3 metres from and directly in front of the MAC’s door. This is the point where sound attenuation should be the weakest. 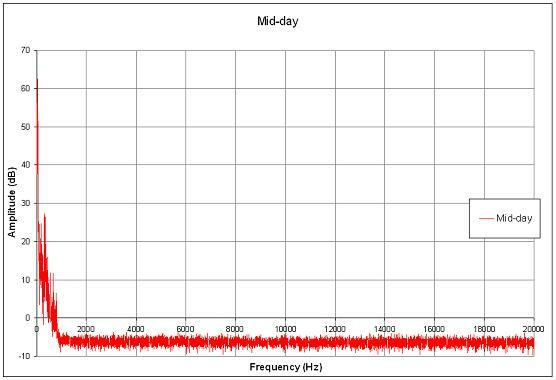 At frequencies in excess of 2000 Hz the attenuation exceeds 60dB and it is at 50dB for frequencies between 400 and 16000 Hz. 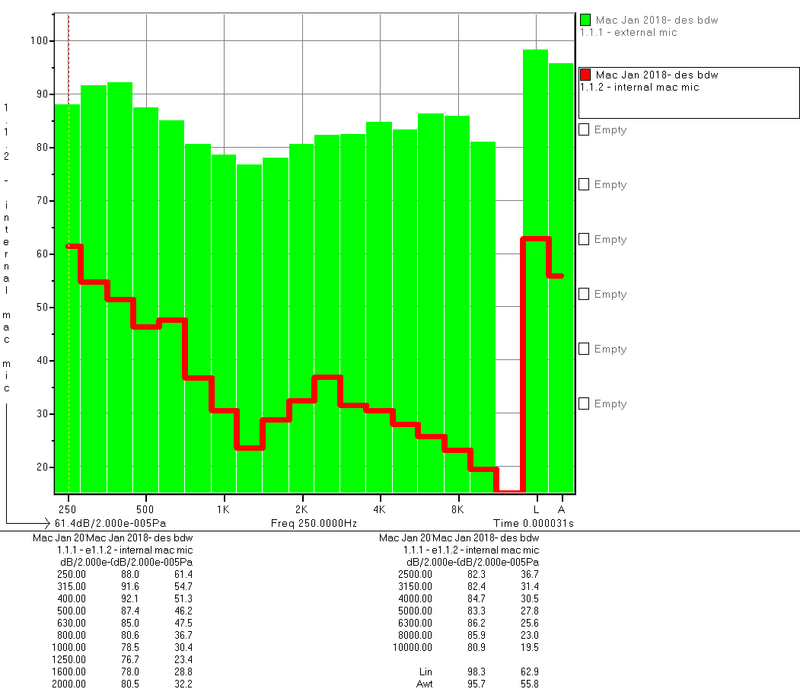 The RT60 decay time for frequencies > 300Hz is 0.012 seconds. 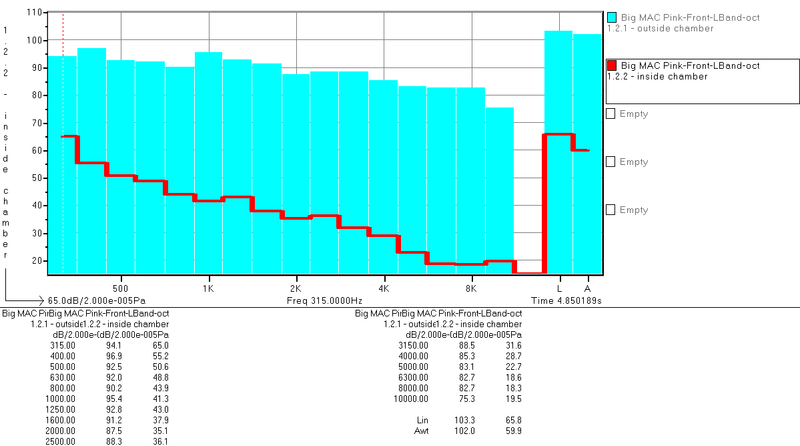 A customer measured internal noise level of a Super Big MAC; located in a working laboratory with the normal level of background noise, people talking etc. MAC - Designed to fit on top of a standard desk.